Although they had repeatedly demonstrated their exceptional utility in irregular and woods warfare during both the Revolutionary War and in Wayne's campaigns against the Ohio Indians during 1793-95, there were no regular rifle troops in the United States Army between 1796-1807. However, imminent threat of war with Great Britain in the wake of the Chesapeake-Leopard Affair led to the establishment of a Regiment of Riflemen to augment the fledgling regular forces in late 1808. Consisting of ten companies, primarily recruited and organized in the Mid-Atlantic and Southern states, the regiment never saw service as an intact corps, but rather in company-sized detachments. One of these, attached to the 4th U.S. Infantry, received its baptism of fire at the battle of Tippecanoe in November 1811. Ironically, the riflemen fought against Indians in that pitched frontier battle as musket-armed infantry, having turned in their defective rifles for repair at Harpers Ferry just prior to the campaign. 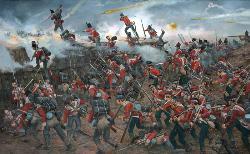 With the onset of the War of 1812, another company— commanded by Captain Benjamin Forsyth—signalized itself in raids, skirmishes and battles along the Canadian border against the backdrop of an otherwise dismaying series of initial setbacks for American military forces, proving the worth of rifle-armed troops and the need for additional numbers of such. Before the close of the war, three additional rifle regiments were authorized and raised; the original now numbered as the 1st. The firearm issued to a regular rifleman was not the long-barreled Pennsylvania rifle of Revolutionary lore, but instead a relatively plain, half-stocked, military rifle furnished with a 33-inch, rifled barrel of 0.54 caliber. First produced in 1803 at the U.S. Arsenal at Harpers Ferry (then Virginia), this classic arm is called a Model 1803 Harpers Ferry rifle by collectors today, but was commonly called a "U.S. short rifle" or "yauger" at the time. Although well-made and practical in form, the rifle had one major deficiency as a military arm: it was not configured to mount a bayonet or sword-bayonet for fighting at close quarters. Instead, each soldier was furnished with two essential frontier tools that also functioned as sidearms: a riflemen's "scalping" knife and a hatchet or tomahawk. 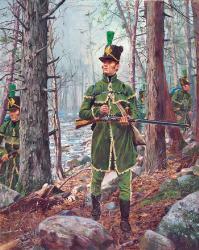 Winter uniforms were similar in cut to those worn by U.S. Infantrymen, but of green cloth with black facings and green woolen overalls with yellow cord trim on the outseams. In 1812, a felt cap furnished with a diamond-shaped plate bearing a stamped 'RR' (for Rifle Regiment) device in front, trimmed with yellow cords and tassels and a green feather plume, replaced the leather cap first adopted in 1808 as regimental headgear. The iconic riflemen's caped "frock" or hunting shirt, with matching trousers or pantaloons, both of green linen and trimmed with "straw" or buff-colored fringe, provided practical, yet distinctive, garb for warm weather service and fatigue duties. 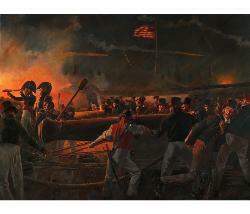 Print Image Size: 11 3/8" x 14 1/2" Print Overall Size: 15 3/8"x20"
Canvas Giclee: 16" x 20"